It’s almost October and the weather is still hot in Florida. But after 23 years here, I’m getting acclimated. Let’s start off with some mail. Got a letter from Bob Connolly with a picture. The photo was taken in Feb 03. 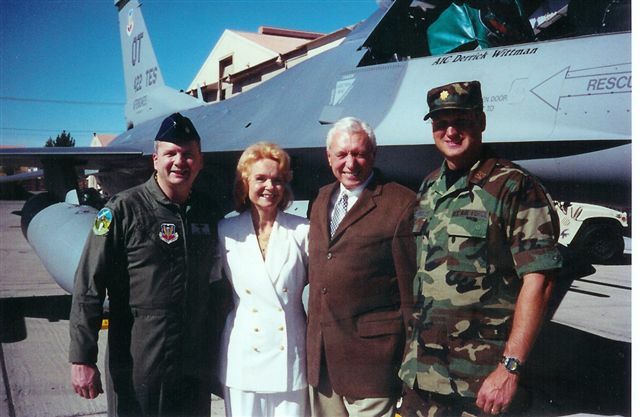 Left to right are son, Lt Col Michael Connolly, USAFA ’85, Pat Connolly (Mom), Bob (Dad), and other son, Maj John Connolly, CA ANG. "Photo was taken as Mike assumed command of the 6th Combat Training Sq, Nellis AFB, a part of Air Ground Operations School. Mike has 2000 hours in the F-16. John is Commander of the Services Sq in the 146th Wing, Channel Island ANG Base. John, a high school English teacher and water polo coach, was called to active duty in June of last year and enjoyed 90 days in Pakistan as part of Enduring freedom. Each son is married and has two sons. Pat and I live in northern San Diego County. We enjoy riding our horses daily and I limit golf to three days per week. " Thanks for the update, Bob. Now a July email from Mitch Eckel. "I'm still running a three- lawyer law firm in Acton, MA. I'm blessed to have two woman lawyers who work with me, and they are doing a good job of shaping me up. Notwithstanding the proclamation that the estate tax is dead, as estate planners and administrators with a tax and elder law bent, we are staying busy. I'll be going back to my 45th high school reunion in No. Little Rock, Arkansas this August, and I'll be interested to see if my female classmates look as good as the wives of our Zoo classmates did last fall. Otherwise my three sons are still diddling around keeping several significant others (females) on the line so we have no grandchildren. We're beginning to feel left out." Hang in there, Mitch. Your day will come. 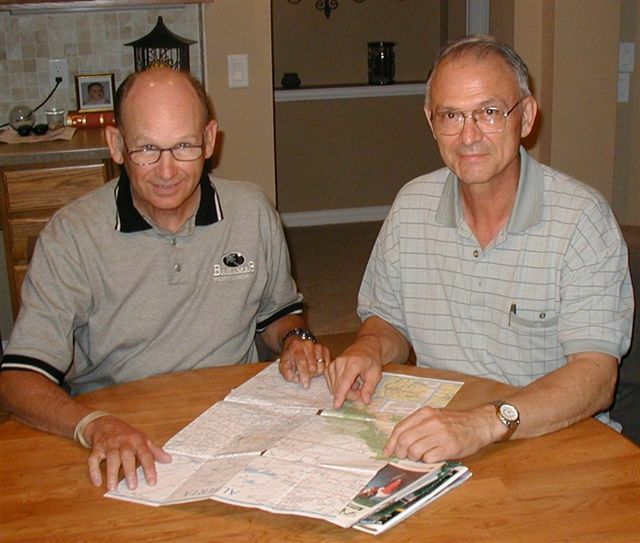 Heard from Chuck Turner: "Attached is a photo of Gary Forrest showing me his route to and from Alaska. He was on the way home to Florida after a 14,000-mile trip in his van, camping all the way. Sounded like he took just about every side trip feasible. " From Jim Mack: We had a nice summer reunion (practice 4th of July bash) at the Mack house on June 27th. Rip & Jean Blaisdell, Tim & Nancy Gilmartin, Huck & Karen Spory, Bob & Ginny McNaughton and Rudy & Betty Bow graced this joint. The Robinsons (PK & Reta) and the Ohmans couldn’t make it because of summer travel. Everyone seems to be doing fine in a creaky sort of way since most of the available beer and donuts vanished just as they should. We had such a good time, we had a rejoin the following night at Huck’s estate downtown, Nice times!! And this one from Chet Griffin: "I guess this is one of the things a fellow does as he closes up shop at work. Wednesday "Mr.Northrop" treats me to a luncheon, and Friday I'm outta here!! Retiring is as exciting as I always dreamed it would be. I get tired just thinking of all the things I plan to do with the huge amount of time I can now invest in other things. Eva Lee and I will be doing the traveling that we have put off for a long time, and the size of her job jar and the extent of my "things" I enjoy doing make me think that coming to the office might be a lot easier. We'll be seeing you, and that's true for everyone in this address book." Thanks, Chet. And may you enjoy your retirement. See you in Florida, soon. Got this from Chuck Cheeseman: "The final pair of TG-14 Ximangos was recently delivered to USAFA by Chuck Cheeseman and his partner, L/Col (Ret) Keith Phillips. Cheezie was the pilot who landed as number two, thereby becoming the last delivery pilot to land at USAFA. (Cheezie was also the pilot who landed the first TG-14 at USAFA on its delivery flight last June, 2002.) USAFA now has a new fleet of fourteen TG-14 Ximango motorgliders to supplement its towed gliders. (See the cover of Checkpoints, Winter 2003, for a photo.) Also, Chuck mentioned that RTB Don Baucom did an excellent book review of Edward Teller's memoirs in the new issue of Airpower History…Don's account is a good job of describing what Teller wrote and where he fit in a few words." Thanks, Cheezie. Got an email from Grant Lannon: "We are doing great in flying aircraft in the Commemorative Air Force in the current air show season. The Yellow Rose B-25 has made all our air show dates and sometimes the T-6 (that I own with a partner who flies the B-25 with me) goes along. For the B-25, starting in March, we made (10 air shows) so far. We have three shows coming up and the constant partying is wearing me down. 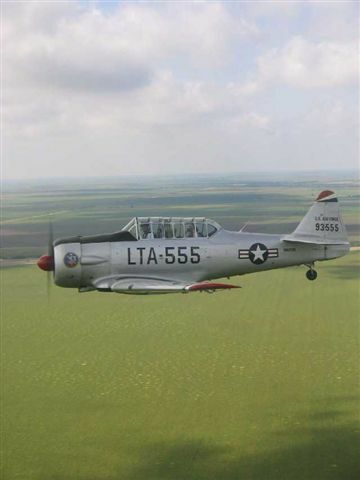 On the way back from Alice, I flew the T-6 in formation with the B-25 and we got the attached shot. If you look closely, you can see Grant Lannon at the stick of the T-6. Flying WWII aircraft, with a bunch of others in all kinds of airplanes is a real thrill. Who would’ve thought that the pictures I cut out and pasted in a scrapbook as a kid would become reality." Thanks for the update and the picture, Grant. You look so young. Is that really you? Got a copy of a Reno newspaper article that I’ll summarize. Sam Dehne sees himself as a "watchdog" when he attends city, county, Convention and Airport Authority meetings. Dehne sued both the City of Reno and the Airport Authority after two separate instances in which he was kicked out of meetings, including one where he was arrested and hauled out of an Airport Authority meeting. U.S. District Judge Howard McKibben threw the cases out. Two weeks ago, though, the 9th U.S. Circuit Court of Appeals ruled that Dehne's lawsuits could proceed and be heard by a jury instead of a judge. " Attaboy, Sam. Don’t let them grind you down. Don Shepperd is on a special assignment to Iraq with several other military analysts and think-tank brains. He can’t report on where he is going but will probably have some opinions to share on the Redtag Net after he gets back. If you want to be on the net, contact me. Also, my wife bought me a copy of Don’s book, Misty, the story of the F-100 Fast FACs in Vietnam. It has lots of individual stories contributed by former members of the Misty group. I read stories by Jim Mack, Lanny Lancaster, Chuck Turner, PK Robinson, and Don. It was an exciting and terrifying time for them. Good reading, though.